We Are What We Are begins with a gloriously overproduced storm, filled with clear raindrops and fallen leaves running into a small and muddy river, setting the tone for the drama to come. The rain stampedes through a forest and into a clearing, revealing a small, whitewashed farmhouse. The house belongs to the Parkers, and we are about to learn some of the family secrets. We Are What We Are is a horror film, but a beautifully rendered one, light on the gore and heavy on religious fervor and mood. It’s a reboot of the 2010 Mexican film Somos lo que hay, and while it maintains the general premise of the original story, director Jim Mickle has brought his tale into the United States and centered it around a domineering father figure (Bill Sage). During the torrential rainstorm at the beginning of the movie, tragedy strikes father Frank, as well as his three children, Iris (Ambyr Childers), Rose (Julia Garner) and Rory (Jack Gore), when Mother Parker dies. This leads Frank to force his eldest two children to perform a set of rituals based on a horrifying family tradition. Those reading this review may have gotten a chance to see the film when it was given a limited release in theaters back in September. A tiny theatrical release means many who might come across this review have not been given the opportunity to catch the film on the big screen, and it’s one of those films that is at its best when it still offers a bit of shock value. Upon second viewing, however, a lot of lovely camera angles and shots should be a treat for viewers, and it should become clear how nuanced performances from Kelly McGillis and Michael Parks actually are. The film is never short on atmosphere, offering plenty of tension thanks to nearby neighbors and the world’s creepiest shed. While We Are What You Are is rarely thrilling, it’s still a film to be viewed with the lights off. You can order We Are What We Are over at Amazon. Best Special Feature: The bonus features are scarce with the independent release, but some time was put into the "An Acquired Taste: The Making of We Are What We Are" featurette. The music in the segment is a little melodramatic for my taste and we mostly get behind-the-scenes footage of scenes getting shot, but it’s a stark contrast to most making of segments, which don’t give audiences a good look at the scenes setup. I would have liked to have seen a few more interviews within the segment that explained what was going on, although there are interviews available on the disc, as well. There have been plenty of brash and cocksure characters on television before, but none quite in the amalgamation that House of Lies offers during its second season on the air. Things are changing for Marty Kaan (Don Cheadle) and his pod (Kristen Bell, Ben Schwartz and Josh Lawson) as a brand new boss takes over at Galweather & Stearn. Faced with a bad boss and a new set of priorities, Marty decides to take his career in a brand new direction, although that decision comes with unexpected consequences. 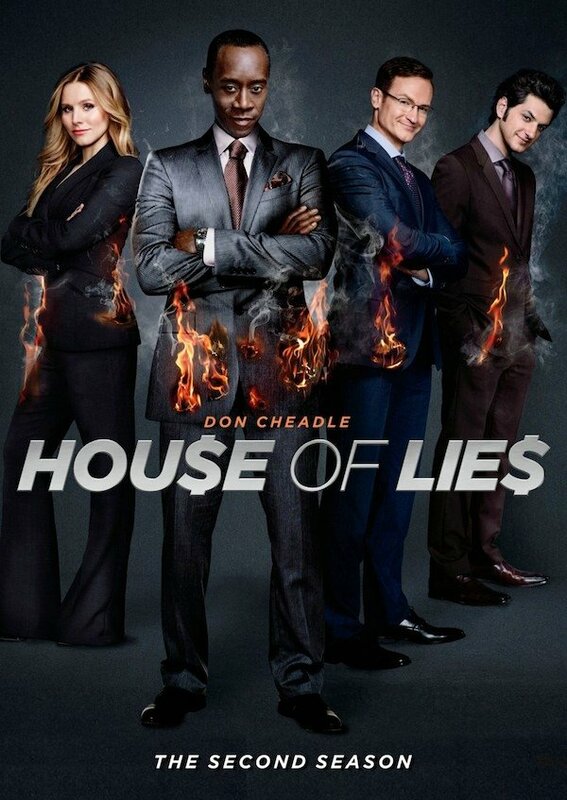 It sounds like more of a drama, but Showtime considers House of Lies to be a comedy that runs in a half-hour timeslot. Luckily, our cast of characters are at their best when they are fast-talking, so a lot gets said and done in a short time period. The writers on the show are pretty good about weaving Marty’s personal narrative in with acquiring and maintaining high-end clients. While we get some personal life stuff from Bell, Schwartz and Lawson’s characters, House of Lies is frequently focused on Marty, highlighting this idea through the character’s direct addresses to the camera (although this device has been finessed since Season 1). When House of Lies is on, the show balances complicated and narcissistic personalities with quick-paced wit. The conversations are often fun and funny, and later during Season 2, the show even goes out on a limb and delves more and more frequently into serious issues. The biggest problem with House of Lies, then, is its set of characters, who forever feel as if they are on a circular trajectory, learning little and making many of the same mistakes. Maybe that’s how life is for a lot of people, but it doesn’t make for the greatest binge watch. At a half hour a week, Showtime’s drama could be worth tuning in, though, especially as it continues to work through its growing pains in Season 3. The DVD set is nothing to write home about and should be reserved for those who will want to peruse the episodes again and again. Bonus features are typically lackluster with TV sets that don’t inspire crazy amounts of fandom (See: Game of Thrones), however, all fans will get with the Season 2 set are a few lackluster audio commentaries and a nearly worthless "Biographies" feature. Luckily, Amazon’s pricing for House of Lies: Season 2 has already been knocked down from the original list price quite a bit. When Ben Affleck and Justin Timberlake signed on for the crime thriller Runner Runner, the project seemed as if it would be one to watch. Affleck, especially, has been on a hot streak with thrillers, putting out both The Town and Argo over the past couple of years. This time around, he wasn’t sitting in the directors chair. The Lincoln Lawyer’s Brad Furman assembled an acting team including the two aforementioned names but also Gemma Arterton and Anthony Mackie. With such a strong team in place, what could possibly go wrong? Apparently, quite a bit. While Runner Runner starts with a fine enough premise and an excellent cast, it’s a mess. The movie tries to feel as if it’s set in the now, taking a stance on the hazards and promises of the online gaming industry, but it more often feels like a soapy narrative than a story that’s grounded in reality. Still, I can deal with a little incredulity and wild lines of reasoning as long as the third act is satisfying. Yet the ending is mostly where Runner Runner misses the mark. Audiences will find themselves patiently sitting through a better than average setup for a thriller, set against a backdrop of exotic locations and money-rich properties, only to find a movie that dithers and dithers until it comes to an ultimate conclusion that feels forced and unimaginative. It’s kind of nice to see Affleck play the morally convoluted character in gambling lord Ivan Block and it’s nice to see Timberlake back in an overly articulate smart guy role. The film’s not a total disaster in its casting, but there are just so many weird plot dalliances that its hard to really get into bed with the characters as they make business deals and play a most dangerous game. Still, fans of Timberlake, Affleck or Arterton can nab this one over at Amazon today. Best Special Feature: People didn’t love Furman’s last film, The Lincoln Lawyer, but there were plenty of moments in that movie that kept it grounded in reality. 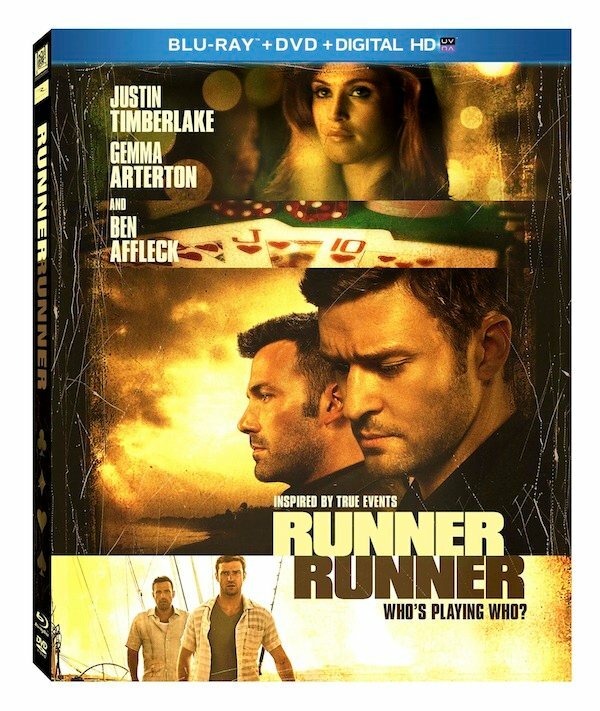 Runner Runner has the opposite mentality, and nothing shows this like the deleted scenes. I mean, honestly, the first of these is a scene shot in a giant cave. Ivan Block emerges from the shadows only to conduct a shady business deal as he looks out over one of the most beautiful settings I’ve ever seen. Forget the back rooms of bars, all shady business deals should go the way of the cave. "House of Cards – The Inside Story of Online Poker"
While there are some independent releases and rereleases on this week’s list, the bulk of the January 7 Blu-rays and DVDs are television shows. The critically acclaimed BBC America program Being Human is dropping its third season along with a slew of special features including last year’s Comic Con panel, bloopers and multiple featurettes. In addition, the fourth season of Archer is hiting Blu-ray, alongside seasons of The Following, Copper, Duck Dynasty, Star Trek: Enterprise and Top Of The Lake. If none of those are up your alley, you probably don’t like television. For a fuller rundown of releases, you can check out the list below. All are available on Blu-ray and DVD, except where otherwise indicated.